What is Vinylux? No time to cure with a lamp? No need with VINYLUX ®! 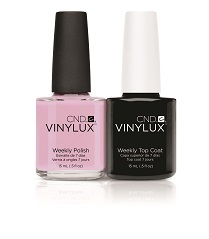 VINYLUX ® Weekly Polish delivers week-long wear with brilliant shine that lasts! The fast-drying formula is chip-resistant, and has increased durability with natural light. Available in over 100 fashion-inspired shades to change your look (or your client’s) as often as desired! It’s a simple 2-step application (VINYLUX® Weekly Polish and Weekly Top Coat)- No base coat needed! Our customer’s favorite part is the removal. No soaking, foils or dreaded drills. Simply have your clients wash their hands with soap and water. Massage some COOLBLUE ® into the skin to cleanse and prevent spreading of germs. Then saturate a plastic-backed, lint-free pad with CND ® SHELLAC ® Nourishing Remover. Hold the pad over the nail plate to gently dissolve the polish. Use firm pressure and a circular motion to lift the color off the nail. Then rub once again with a pad saturated in Nourishing Remover to remove any residue. And that is it! No hassle. Just long-wear, brilliant color that helps your clients reinvent themselves, weekly.